I am addicted to the drama series Scandal starring Kerry Washington! I just love Olivia Pope who is the character that Kerry plays and more importantly - her fashion sense! Olivia's wardrobe has become a huge talking point - her character is always dressed immaculately in luxurious tailored trouser suits or classic, sophisticated pencil skirts and silk blouses and she has some of the most gorgeous overcoats I have seen on the telly! (below). 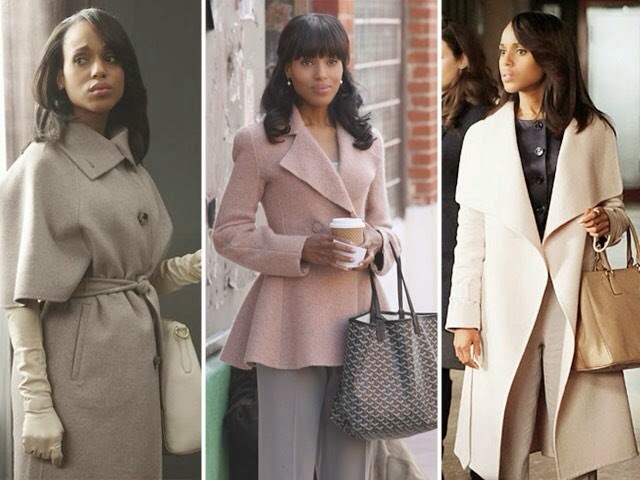 The notoriety of Olivia Pope's wardrobe has inspired lots of fans of the show to try to emulate her fashion forward look and lucky for us, Kerry Washington has now launched a clothing line reproducing the many signature looks of her character! 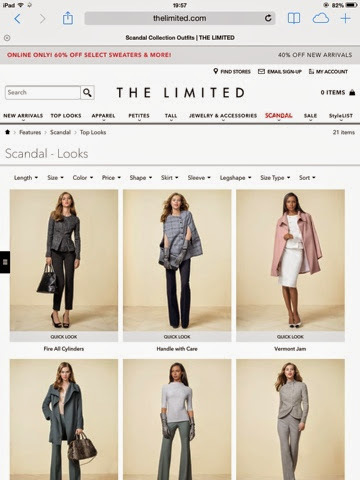 The Scandal collection can be found at fashion retailer The Limited (click here) and it has so many fabulous pieces in the typical style of Olivia. The collection in my opinion is designed for the independent, successful and strong career woman who wants to look powerful without losing her femininity. I think my favourites are the capes and oversized coats which are in fabulous muted colours, which just look so chic and ladylike. The line has been designed by Scandal's very own costume designer Lyn Paolo so the collection is very authentic with what you would see in the show. 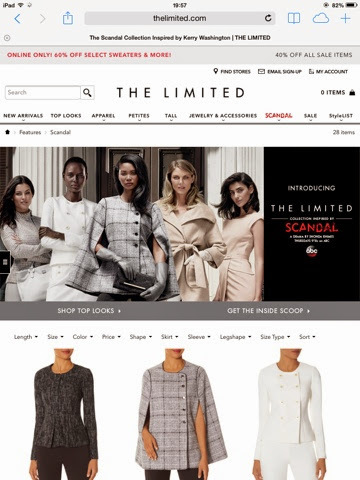 The Limited is a US website although they do ship to the United Kingdom also so if you are a fan of the show and want to channel Olivia Pope next time you're at the office, check it out! Let me know what you think of the Scandal Collection or if you have already brought something! !